UPSSSC VDO Exam Syllabus 2016 – UP Gram Vikas Adhikari Gram Vikas Adhikari Exam Syllabus of Preliminary and Main exam: Are you looking for UPSSSC Gram Vikas Adhikari Mains Syllabus? UPSSSC VDO Mains Exam Date announced and it has scheduled to be held on very soon. The Uttar Pradesh Subordinate Services (UPSSSC) will conduct the Examination to recruit Gram Vikas Adhikari (Village Development Officer) and other next month. The Uttar Pradesh Subordinate Services (UPSSSC) issued notification to recruit Gram Vikas Adhikari posts through online examination in January 2016, they will conducted Preliminary Test exam and then Main exam of the selected candidates. Now, they are moving fast and announced UPSSSC VDO mains exam which has been now scheduled to be held in March 2016. All those candidates who have applied for UP Gram Vikas Adhikari exam are looking for UP Gram Vikas Adhikari P.T. and Mains exam syllabus in order to preparing for UPSSSC VDO written examination, 2016. What to study and how to study for UP VDO (Gram Vikas Adhikari) P.T. and Mains Exam 2016, is one of the most frequently asked question by all those candidates who are going to appear for UPSSSC Gram Vikas Adhikari examination 2016. Fortunately, we are providing syllabus of UP Gram Vikas Adhikari (VDO) Examination. Candidates must cover these topics we have listed below in order to prepare better for UPSSSC VDO exam 2016. We have already discussed about UP Gram Vikas Adhikari exam pattern. 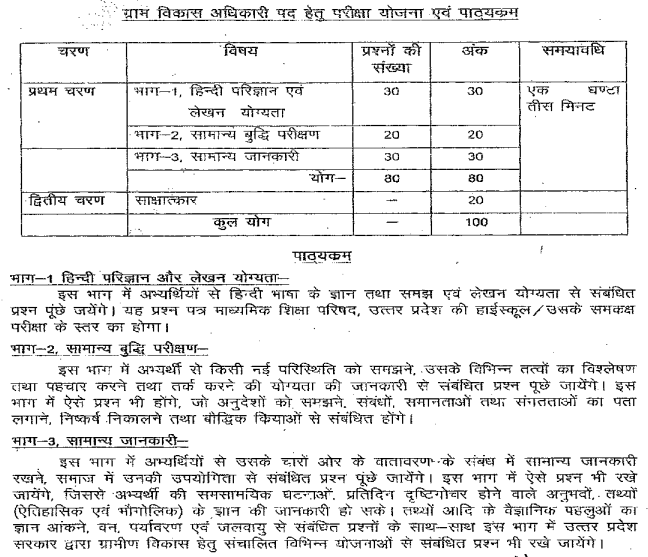 UP Gram Vikas Adhikari Preliminary and Main exam will be held of the following subjects for posts. The subject/ Paper we have listed below, there will be asked most number of questions in UPSSSC VDO Mains examination. Let us know, If you have any more questions in your mind.